There is this old German fairy tale where a pair of spoiled children take their parent’s hard work for granted, not appreciating what is provided for them, until a monster known as the Hugelkultur attacks their cottage on night and eats their parents, leaving the children to survive on their own. Just kidding. 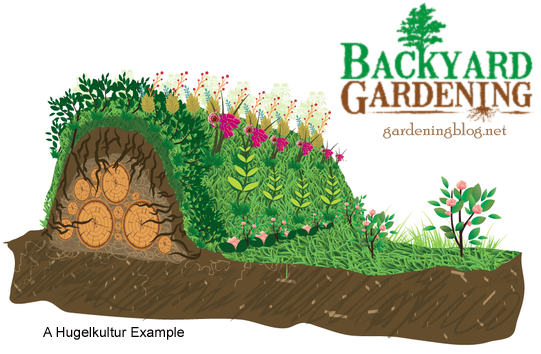 It is a German word, it means “hill culture,” and in practice is a method of gardening where you bury wood and then plant on top of it. Things like “lasagna gardening” (where you build up a raised bed by alternating layers of compost, twigs & debris, newspaper and cardboard, and soil) are a variation on this, but true hugelkultur is pretty extreme, not just laying in sticks and twigs and garden debris with soil as you build a raise bed, hugelkultur could best be describes as covering up a firewood pile with soil, so you have a mound, or a swale, or a terrace. You put whole logs down, piling them on top of each other in a long triangular shape, then cover with soil. You have this sort of mound garden. Why do this at all? The wood both increases drainage and water retention, buried wood is capable of holding water like a sponge, it becomes a buried reservoir of water for your plants, and as it decomposes it increases organic matter and microbial activity in the soil and creates air pockets. It is also a decent method in any area where a raised bed is a good idea, namely areas where the ground is too rocky, the soil too shallow, or the soil just of too poor quality to do a proper garden bed. So rather than dig a bed into the ground, you build a bed on top of ground. Hugelkultur beds don’t have to be huge piles, they can also be built flat. You could layer logs and other wood at the bottom of a flat bed, like a raft of wood, then pile soil on top. That works too. As the wood decomposes it will of course shrink and so you need to account for that. When I was tilling my new garden I made what you might call accidental hugelkultur. Originally my land was all forest, and I had trees felled and stumps ground, all that wood debris ended up mixed in the soil, all the roots ended up decaying in the soil. Then, when I tilled, I chopped up some roots pretty good as well. It isn’t strict proper hugelkultur where a more or less solid layer of wood is deep under the soil, however there is a lot of buried decaying wood in my garden and I will likely get a benefit from it over time. Are there downsides with doing this? Yes. For one, if you use fresh wood, it will lock up significant amounts of nitrogen, adding some nitrogen to the pile in the form of blood meal or green manure would surely help. Already partially or mostly decayed wood (ideal) is better for this reason. Also the aforementioned shrinkage may annoy you over time, but I sort of doubt it’d be a big deal. OF course these sorts of beds cannot really be tilled (as I said above, I have some wood in my garden, but it was small pieces, not logs, and I have a heavy duty tiller than can break 4 or 5 inch roots. Burying a layer of mulch under a new bed would work the same and still allow tilling, but overall I would say this is best for areas that will be permanently planted, and not worked year after year). One potential upside though is you could get some mushrooms. If you start with fresh logs not yet infiltrated with fungi you could inoculate the logs with edible fungi plugs or spores and then, over time, be able to harvest those mushrooms. The overall point I want to make with this post is this. If you’re building a new raised garden bed, and you have some wood debris, not only is it okay for you to bury it at the bottom of the bed, it is actually beneficial in the long run to your soil. I love the story you made up about the hugelkultur monster. Super charming. When I prepared a southwest facing garden bed along my garage wall, I piled up fallen branches from a neighbor’s tree and layered seedless straw on top. Then I piled a pitiful amount of garden soil on top. It’s… hugel inspired, more than it is actually a hugelkultur proper. The result is pleasantly porous and full of interesting crevices, and has proven to be a wonderful place for radishes, chayote squash, and California poppies. Yup, its a great way to recycle garden/yard waste while helping the soil. Great post! I like the gardening style of Hugelkultur. It’s very unique and if done properly can really make a garden stand out. I just moved to rural Missouri, and the soil here is horrible. Clay everywhere! I am cleaning part of the backyard and I have a lot of brush, that I didn’t know what to do with it. Although it is too late to do it now in the Spring, I will start building it and maybe in the Fall to grow spinach. A very unique design of gardening. I have never seen something of this sort and I will definitely give it a trial. Thanks for sharing! !